CEO Brendan McDonagh told the Oireachtas public accounts committee that taking on loans from IBRC represents “a major challenge for NAMA”. NAMA EXPECTS TO TAKE ON on “substantial proportion” of loans from IBRC as a result of the bank’s liquidation according to its chief executive. 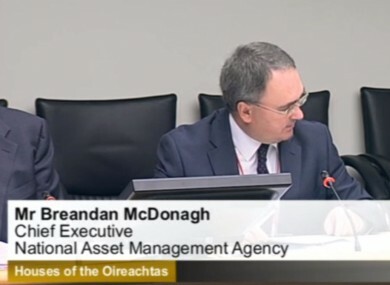 CEO Brendan McDonagh told the Oireachtas public accounts committee that the transfer of these assets is expected late this year or early next year and represents a “major challenge for NAMA”. McDonagh put the scale of the challenge in context by saying that the agency currently deals directly or indirectly with about 800 debtors, this could increase to over 3,000 if it takes on the loans it expects from IBRC. McDonagh says that NAMA expects to hire an additional 220 staff to deal with this increased workload. McDonagh also stated that 28 staff members, or more than 10 per cent of all NAMA staff, have left the agency so far this year. This is in addition to 22 staff members who departed in 2012. McDonagh said that NAMA is ‘doing its best to keep people’ but the reality is that NAMA’s finite remit until 2020 discourages people form staying. Under questioning from Labour TD Derek Nolan about whether those leaving NAMA to go to the private sector have an unfair commercial advantage, McDonagh said that only a few senior people have access to NAMA’s long-term strategies. NAMA has made more than 85 per cent of its sales outside of Ireland according to McDonagh. Of the €9.2 billion generated in sales so far by the agency, just €1.2 billion was made through sales in Ireland. In total NAMA has generated €13.7 billion in cash for the taxpayer since it began operating with the extra €4.5 billion coming from rental and other non-disposal income. McDonagh said that the agency was “very fortunate” that such a large portion, 44 per cent, of the properties it took over in 2009 were outside of Ireland. This, he said, has allowed NAMA be selective in releasing properties into the Irish market, only releasing properties “in terms of the Irish market’s ability to absorb them”. Sales in Ireland have been governed by two key principles according to McDonagh, “no firesales and no hoarding”. NAMA also says that it has been luck that most of the Irish properties it owns have been based in the urban areas of Dublin, Cork, Galway and Limerick. The agency currently has €1.5 billion worth of properties on the Irish market with a further €300-400 million due to come on the market in current weeks. These will be mostly office spaces and McDonagh says NAMA has been working closely with the IDA to provide accommodation for major global businesses with plans to create jobs in Ireland. Earlier this year NAMA reported a profit of €228 million profit for 2012. McDonagh says that the agency has also recorded a profit for the first half of 2013 but was not in a position to give details of the figures as yet. Email “NAMA expects to hire up to 220 staff to deal with loans from IBRC's liquidation”. Feedback on “NAMA expects to hire up to 220 staff to deal with loans from IBRC's liquidation”.